During these really hot days of summer (I wonder why they're called 'dog days of summer'?) we like nothing better than tall, ice cold glasses of refreshing and thirst quenching 'agua fresca'. You can make 'agua fresca' from any fruit by just combining with water and a bit of sugar, honey, or sugar cane juice, if needed to sweeten it up a bit... I like using a simple syrup most of the time. Lemon, oranges, or lime, watermelon, passion fruit, guavas, mangoes...even peaches, nectarines...etc...when combined with water and a sweetener is an agua fresca. One of our favorites is the Pineapple Agua Fresca. The pineapple in this case, serves triple purpose for the price of one. We buy a pineapple at the farmers market or use one of our own when they become harvestable; peel and cut it up to eat, but I save the top for planting, and the peelings for making the agua fresca.., Win-Win-Win! This is one of our favorites. It is the easiest and most delicious summer cooler, ever. The twist is that you get to eat the pineapple and make “juice” too! Cut off the top and bottom of the pineapple and reserve. Peel the rest of the pineapple, leaving a bit of pulp attached, and reserve. Cut the pineapple in chunks or in long slices from top to bottom, cutting off the core and reserve. Use the fresh fruit any way you would like. Place the peel, bottom, and core in a non-reactive pot, add the sugar and water and bring to a boil. Turn the heat down and simmer for about 10 minutes. Cool and strain into a pitcher, squeezing as much liquid as possible from the peel pieces and the core. Chill in refrigerator for at least an hour. Serve over ice and garnish with a sprig of mint. Note: Plant the top of the pineapple in the garden and compost the rest of the peel. Breakfast meals and brunches are usually some of the hardest to put together when hosting a group, be it family or guests; especially for the inexperienced cook, since most or all the dishes on the menu need to be ready at the same time. My solution is to make several lists! First decide how many people you feel comfortable inviting at one time. Make a list. Can you sit everyone at table or should you serve buffet style? Do you have tablecloths, napkins, enough matching dishes, flatware and glassware or will you be using disposable serving ware? (*) Make a list of the items you will need for the type menu planned. Make your guest lists and send the invitations at lease 3 to 4 weeks ahead. Remember your guests might have very busy lives and need to plan ahead of time. Be sure to specify a day at least a week ahead of the brunch for the RSVP deadline. Â It will make it easier on you to know that far ahead how many to expect. Plan the menu around a few simple ideas or be as elaborate as you feel capable; just make sure you are comfortable with the plan. After deciding on menu, make three lists; one for the menu broken down into recipes for each dish; one for the grocery staples that can be bought ahead and one for the fresh items you need only a day or two before. To make the process easier, take each recipe apart, item by item and place the items on the appropriate list, ie: " Staples or Last Minute. Make lists on what can or should be done when and post them on a planning board either in the kitchen or your office space", along with a good calendar with large squares so that you can put on each date what can be done that day. By looking at the menu list and the grocery lists you can decide what staples can be bought even a week or two before the brunch. Buy them and store with notes of 'do not touch' if you have family members who make use of your pantry stock. A few days before the brunch, look at your menu again and take each recipe apart, step by step, and see what can be done (prep or cooked) a day or even two ahead. Peel and chop veggies and store them in individual plastic baggies until needed. Things like bacon can be fried a day or two ahead, wrapped and stored in fridge. Hard-boiled eggs can be done and even peeled a day or two ahead. Poached eggs can be done a day ahead and stored in bowls of water in the fridge, then taken out and placed in warm water an hour or two before they are needed. The day before the brunch start setting your table(s); pull out and wash all the dishes, flatware, glasses and serving ware you will need. Start placing them where you need them. Buy or make your table arrangements. Be creative. Don't fall back on the usual, but look for items around the house that will fit the theme and use them to liven up your table. By doing as much as possible during the weeks, days and hours before your guests are scheduled to arrive; you will have accomplished most of the work and will be less harried and also less apt to make last minute mistakes...and if you make mistakes, they happen even to the most seasoned cooks, so go with the flow and don't worry about it. Probably only you will know that you made them. My last advice is this; don't sweat the small stuff. Enjoy your party! (*) If you opt for disposable, there are companies that sell compostable serving ware, from dishes to napkins to flatware. Some of them in pretty designs! In today's lifestyles so full of clutter and trash, try to be a bit green and do your part. If you don't compost, find a friend or neighbor that does and would be happy to take the compostable serving ware from you. The nights and early mornings are a bit cooler but the heat holds on during the middle of the day and persists up until early evening...Although I can almost 'smell and see' autumn coming, summer, at least in the middle of the day, will continue to hang on for a bit.. Yes, believe it or not, we do have changes in season in Hawai'i...they're subtle, but they're there and you learn to recognize them after living here a couple of years. We love to make our own 'aguas frescas' - literally it means fresh waters, but it's the name given in Mexico to 'refreshing' water infused with fruit or vegetable juices. My favorite is pineapple agua fresca. Here is an article I recently wrote for the July/August 2016 issue of Ke Ola Magazine about "Aguas Frescas" and it has the instructions on how to make my favorite pineapple drink...also several others, including watermelon. Cool Waters: 50 Refreshing, Healthy, Homemade Thirst Quenchers ...Dribbleicious! 1/4 teaspoon white vinegar (I used apple cider vinegar). Combine the watermelon chunks and basil in a colander placed over a large bowl. 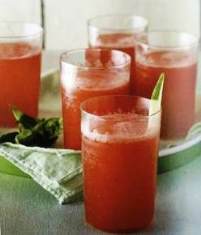 Using a metal ladle or spoon, mash and press the watermelon and basil to extract as much juice as possible (the remaining pulp should be fairly dry). Season the juice with the sea salt and vinegar and strain through a fine-mesh sieve into a large pitcher. Top up with water as desired, stir and serve. Here's to refreshing hot summer afternoon aguas frescas! How does my garden grow...today? Cloudy, soft on and off rain...the garden is just slurping and loving the moisture. Everything is thriving, including the weeds...I am almost giving up on them. I need to bring in loads of mulch but am worried about 'importing' little red fire ants...so far we don't show signs of having any, but they're in the area. Might just have to shred newspapers and use ingenuity to mulch...not enough leaves from our own trees to shred and use at this time. At the East Hawaii Master Gardeners plant sale a few weeks ago, we bought some green bean starter plants and were given a new-to-me variety of tomato plants called Big Zac to play with. UH School of Tropical Ag was giving them away if you signed up to enter the "Big Tomato Contest"...so we did....We got 2 of them and planted them the very next day. The Big Zac can grow to 3 or 4 pounds with larger tomatoes not unusual at all. We normally can't grow large tomatoes due to our rain (the fruit splits almost before ripening) and critters, so I am really interested in seeing how this big boy will respond to our conditions. The following photo is taken from the Internet and it is of a Big Zac - I would be pleased if I get one to the perfect to pick ripe stage even half that big! At this point, we have two growing fruit, one on each plant, and some blooms, which we're selectively allowing to grow, but will monitor to make sure not too many of the tomatoes grow close together or from one stem. and we have Green Beans! ...and this is how my garden grows...today! Yes, we have some tomatoes! A couple of months ago, we planted 3 small Hawaiian Currant tomato plants in the pig through...or what we believed to be the currants... but it turns out they are a bit larger than currants...more like grape tomatoes. and in no time at all...they started producing lots and lots of little tomatoes! It is cooking at this time and the house already smells delicious! Got two pints of delicious goodness! The run of rainy days (and nights!) we just went through are beginning to pay off...the garden is grateful! All three Hawaiian Currant tomatoes are full of tiny tomatoes and still blooming like crazy! These tomatoes are no bigger than your thumbnail...and so sweet and juicy! Both of the Roma tomatoes are also loaded! Do you notice the black plastic pot inserted into the ground in the middle of the tomato cage? We fill it with our compost combination and fill with water (when it doesn't rain) so that the nutrients leach out to the roots through holes we poke on the sides and bottom of the pot. Looks like I need to do some weeding! Manoa lettuce is beginning to bolt...need to harvest it all today...the portulaca just planted along the stepping stones a couple of days ago are already perked up and growing..amazing! This is the area parallel to the pig trough where the Bok-choy and Hawaiian currant tomatoes are planted. I will be filling the empty spaces in the cement blocks with soil and probably plant chives and onion sets in them. This mint is so exuberant, it is outgrowing its pot...Time to take cuttings and start some in another area where it can just grow as much as it wants! These are miniature pineapples. They never grow bigger than this...about 4 inches total from tip of the 'leaves' to the base...used mainly as ornamental plants as there is not much to them, but they're also wonderful as garnishes on a dish or in table flower arrangements. This little one has 3 more pups growing from the base and the other one in the background has 3 more...so from these two little pineapples I can grow 8 more plants in the future, by planting the pups and the tops of these. A few days ago we received about 6 cups of beautiful, sweet grape tomatoes, bursting with flavor...we also received a few small sweet Maui onions. We had used some of them in salads and also making a small medley of grape tomatoes, onions and mushrooms to serve over brown rice at dinner night before last. Using a recipe for red onion jam my sister had shared with me some time ago, I played around with it to include the tomatoes. The results were good! Great combination of sweet-tart taste. I think it will work as a condiment with meats or as a spread with cream cheese on crackers. I placed everything in a non-reactive pan (I used my enamel coated cast iron Dutch oven) and turned heat on high. When it started boiling I turned it down to medium high and cooked it at that temperature until liquid had evaporated by half. I then turned down heat to low and let it simmer until liquid had again evaporated by half. Turned the stove off and left on to cool a bit. I did not use pectin to gel; the 'syrup' partially gelled as it was cooling. Since this was such a small amount, I am storing it in a glass clamp-style lidded jar in the refrigerator. If making larger batches to can, you might have to add acid to bring the pH up for safe canning. I owe this one to my friend Karen in NC...she posted it on Facebook a couple of weeks ago and I vowed when I could collect enough tomatoes from the garden to make it worthwhile, I would be slow roasting them. That day was yesterday! Saturday and Sunday I harvested enough Roma tomatoes from the garden to finally try it. Well worth the time and it is really, no effort! They are not huge, but quite a few of them were a nice size. I lined one of my 12 x 16 jelly roll pans with foil. Cut the tomatoes in half and lay them on the pan, cut side up; add about 2 dozen garlic cloves, a few sprigs of stick oregano (also from the garden) and a sprinkling of my current favorite salt and pepper (Fleur de Sel from Myanmar and Kampot pepper from Cambodia), both of these last were gifts from a friend and both are so special I am quite 'choosy' as to how I use them ;-) - plus a drizzle of olive oil. Set in the oven to slow roast at 250 F - In just an hour after putting them in the oven the whole house smelled delicious! About an hour into the roasting, my son confessed to sneaking a piece and when I fussed at him and told them they were not nearly ready, his reply was "but the smell was driving me crazy and they're good just like that"
I only roasted them for 4 hours. The result was a slightly chewy skin but an intense burst of delicious flavor when chewing. Really...mini explosions of flavor! The tiny leaves of the stick oregano were very crisp and easy to scrape off the 'stick'. I let them 'flake off' all over the roasted tomatoes. The roasted garlic cloves were a bit tough but the flavor was wonderful. I took advantage of the roasting oven already being on and about 45 minutes before taking the tomatoes out, I set in it a small Pyrex dish of asparagus which I had drizzled with a bit of olive oil and sprinkled with the Badia Tropical Seasoning I like so much. Dinner last evening, slow roasted tomatoes on pasta and slow roasted asparagus on the side. HINT: when drizzling the olive oil over the cut tomatoes before slow roasting, make sure you put just a tiny bit more so you can have enough to spoon a bit over the pasta and tomatoes! My favorite recipe for tomato sauce is using roasted tomatoes. I use that sauce for all sorts of dishes, not just as pasta sauce. It can be used for making tomato bisque, as a topping for bruschetta and lots of other ideas. You can find that recipe with all sorts of ideas on how to use it in my new cookbook "From Soup to Nuts"! Check out my brand-new-hot-off-the-press cookbook!